This post is gonna be almost as much “Cool Show of the Week” as it is Cool Actor, because I’ve recently gotten hooked by Have Gun – Will Travel, and that led me to make its star Richard Boone the Cool Actor this time around. Boone, like last week’s Cool Actor Clint Walker, was a rough-and-tumble product of The Greatest Generation — he worked as an oil-rigger and bartender (and toiled at the manly pursuit of writing) before joining the Navy during WWII, where he saw combat in the Pacific. After the war, he attended the prestigious Actor’s Studio in New York. Boone appeared in numerous movies (including Budd Boetticher’s The Tall T) and TV shows before landing the role of Paladin on Have Gun – Will Travel in 1957. When I was a kid, I thought “Wire” was Paladin’s first name. Paladin was an expert with a gun and nuthin’ but trouble in a fistfight, but he also quoted Shakespeare, Browning and others — sometimes as a brawl was brewing. His personal code of ethics leads to some interesting twists on the show, as well. The series is exceptional in its writing (writers included Gene Roddenberry, Sam Rolfe, Herb Meadow, Harry Julian Fink, and many more) and direction (featuring such folks as Andrew V. McLaglen, Buzz Kulik, Lamont Johnson, Ida Lupino and Richard Donner), not to mention the cast. Guest stars included Charles Bronson, Angie Dickinson, Strother Martin, George Kennedy, Ralph Moody, Robert Blake, Ben Johnson, Whit Bissell, L.Q. Jones, and Lon Chaney Jr., to name a few. 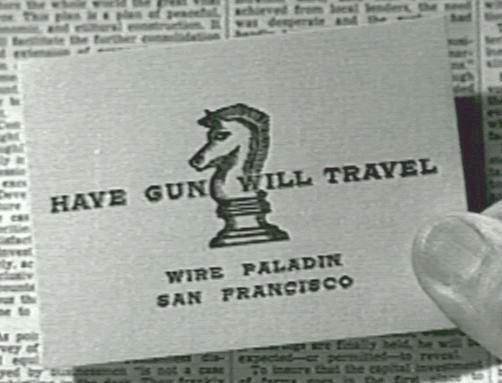 Have Gun – Will Travel ran from 1957 to 1963. The clip below features the theme song from the show and a nice assortment of clips of Paladin in action. In 1958, Boone starred in Albert Band’s horror cheese classic, I Bury the Living, as a fellow who discovers he can kill people by sticking a pin into their plot on a cemetery map. In the 1977 animated TV version of The Hobbit, Boone provided the voice of Smaug, the dragon (an excellent performance, I might add). Also in 1977, Boone appeared in the oddball Rankin/Bass – Tsuburaya co-production The Last Dinosaur as big game hunter Masten Thrust Jr. (! ), who heads into a lost world beneath the polar ice cap to hunt a Tyrannosaurus Rex. It’s an unbelievably trashy movie but very enjoyable. Stick with the clip below to see the T-Rex rolling Boone’s At the Earth’s Core-esque Iron Mole-thingie around like a dog playing with a ball. 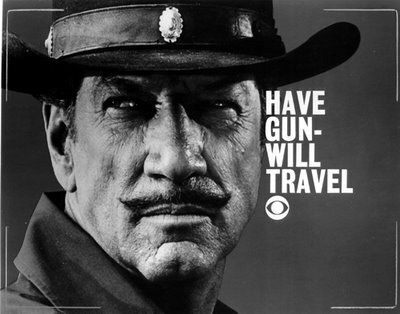 Richard Boone died in 1981 at the age of 63. Have Gun – Will Travel can be seen on Netflix streaming and on the Starz Encore Western Channel.